While racial discrimination dictated that country was for white audiences and blues for black ones, the musicians themselves largely ignored these differences, freely borrowing from each other. The following selections show some excellent “blues” played by country artists, and a gentle folk song sung by someone whose record label tried unsuccessfully to promote him as a “blues” artist. This record is taken from Charlie Poole’s next-to-last recording session, and shows Poole and his band in fine form. The song is an inspired re-working of two blues songs: Sleepy John Estes’ “Diving Duck Blues” (Victor V-38549, 1929) and “Hesitation Blues,” a traditional tune with lyrics by Billy Smythe, Scott Middleton and Art Gillham (first published in 1915). The instrumentation may be that of white, “hillbilly” string bands, but Poole has a real feel for the blues, and his raw vocals do a good job of expressing the yearning emotion of the lyrics: “If the river was whiskey and I was a duck / I’d dive to the bottom and I’d never come up / Oh, tell me how long have I got to wait? / Oh, can I get you now? Must I hesitate?” Odell Smith’s smooth, restrained playing on the fiddle also helps underscore that bluesy feeling. This is a simple, but powerful song, and if it does not fully fit the blues mold, it completely shatters the mold in terms of what other white string bands were playing at the time. Unfortunately, that river of whiskey would be Poole’s downfall. After a lifetime of hard drinking, he would drink himself to heart failure a little more than a year after recording this song. He was 39. Despite having “blues” in the title, this song is not a blues, but another of the Carter Family’s amazing Appalachian folk ballads. This one tells the story of a man who has been captured and imprisoned, and has lost his love in the process. In this recording, Maybelle Carter’s harmony vocals are nearly as prominent as Sara’s lead. The two altos deliver the vocals in a very simple, straight-ahead fashion with very little embellishment, but despite this understated approach, the combined voices create a sound that is riveting. (A.P. Carter also sings on the track, and his voice is more lively, but it is barely audible behind the women.) Maybelle sounds as if she is singing “wearied” instead of “worried,” which adds an extra layer of possible meaning to the song – one that works well with the world-weary delivery of the lyrics. In 1928, John Hurt traveled to New York to record a few sides for Okeh, and this record captures that experience. Like all his recordings, Hurt’s style is very understated and gentle. In a sweet, quiet voice he sings simple lyrics about life in his hometown of Avalon, Mississippi, and feeling homesick for it while visiting New York: “New York’s a good town, but it’s not for mine / Going back to Avalon, near where I have a pretty mama all the time.” Hurt accompanies himself on guitar with a deceptively subtle but intricate fingerpicking style that is incredibly beautiful. 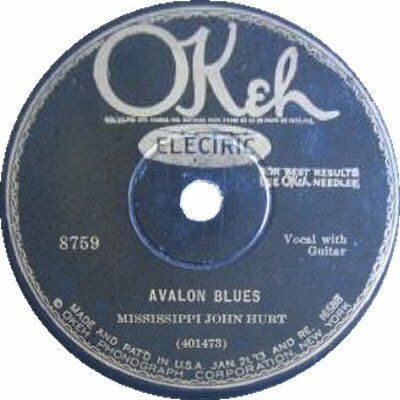 Like all of Hurt’s 1928 recordings, “Avalon Blues” had trouble finding an audience amidst the other, less subtle blues records of the day. 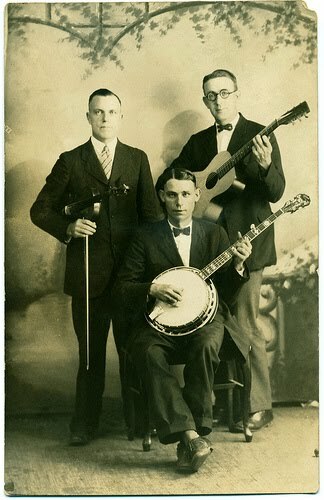 It sold poorly when it was released in 1930, and tragically, no record company would come calling again for 35 years. However, appreciation for his music grew considerably during the folk revival of the 1950s and ‘60s, and in 1963, music scholar Tom Hoskins managed to use the lyrics of “Avalon Blues” like a treasure map to locate Hurt. Now in his 70s, this time Hurt was greeted as a living legend, and he spent the last few years of his life recording and performing for the kind of eager, appreciative audiences that had escaped him the first time around.